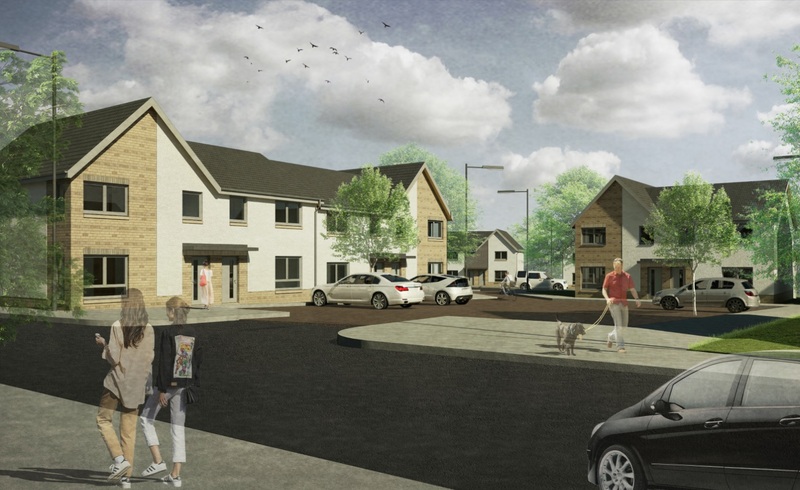 ORA currently await formal Planning Approval for a new 84 unit development at South Avenue, Blairhall for Kingdom Housing Association in conjunction with Campion Homes Ltd. The development site sits to the southern edge of Blairhall and ORA’s detailed design proposals aim to acknowledge and enhance the architectural character and form of the existing settlement. The proposed site layout demonstrates best practice in terms of current planning and design guidelines with specific reference to “Designing Places” – providing an attractive addition to the village. The variation in house type size and scale provides housing opportunities for a variety of family types, all with attractive, active frontages designed to ensure connectivity with public open space and footpaths encouraging social interaction. The development site is flanked to the North and Northwest by existing mature woodland. An element of landscaped screening has been incorporated to the South East corner of the development site in accordance with the Dunfermline and West Villages Local Plan. Notwithstanding the proposed site layout and inherent topography has been articulated to maximise the benefits of fine westerly and southern views towards the Forth, Stirling, the Ochils and beyond to Ben Lomond.